The Chalybes (Greek: Χάλυβες, Χάλυβοι) or Chaldoi (Greek: Χάλδοι) were a people mentioned by Classical authors as living in Pontus and Cappadocia in northern Anatolia during Classical Antiquity. Their territory was known as Chaldia, extending from the Halys to Pharnakeia and Trabzon in the east and as far south as eastern Anatolia. The Chaldoi/Chalybes, Mossynoikoi, and Tubal/Tabal/Tibareni, are counted among the first ironsmith nations by classical authors. Χάλυψ, the tribe's name in Greek, means "tempered iron, steel", a term that passed into Latin as chalybs, "steel". Sayce derived the Greek name Chalybe from Hittite Khaly-wa, "land of Halys". 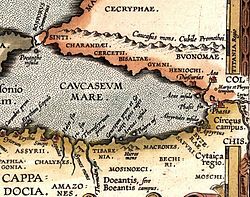 More than an identifiable people or tribe, "Chalybes" was a generic Greek term for "peoples of the Black Sea coast who trade in iron". The main sources for the history of the Chaldoi are accounts from classical authors, including Homer, Strabo, and Xenophon. In Roman times, the Chaldaei (homonymous but unrelated to the Semitic Chaldeans) and Chalybes are mentioned by Plutarch (Lucull. c. 14) as settled in Pontus and Cappadocia, or the Pontus Cappadocicus section of the Roman province of Pontus. ^ I. M. Diakonoff The Pre-history of the Armenian People, Yerevan, 1968 (Delmar, New York, 1984) ISBN 9780882060392. "The Greeks evidently used the name Chalybes for all of the inhabitants of the Pontus who traded in iron ore (see Pauly, s.v. Chalybes); in some cases we might suspect that the Moschi (in Pontus) and/or the Chalybes were foreign designations for the Chaldians (Halitu, Xaghtik') who actually did live between the Tibareni in the west, the Mosynoeci in the north, and the Matieni in the southeast."